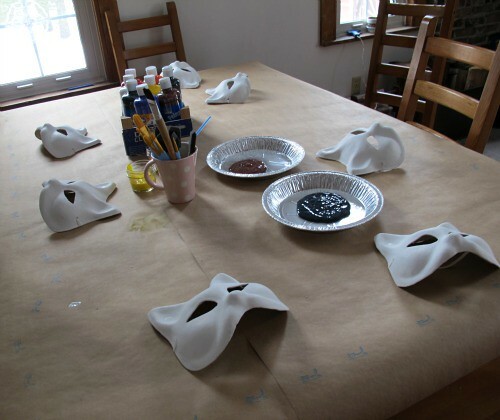 We began with masks. After looking around the web for an interesting tutorial, good ol' Martha pointed me in the direction of this Mardi Gras supply store in New Orleans. Just what we had had in mind... and one less thing for me to make. I ordered paper mache blanks for each child and set out paint for them. After doing a trial mask the the day before, I decided not to get too complicated with glue and whiskers. I knew the girls would want to wear them immediately... so we stuck with one medium (paint) for all of the decorating. This turned out to be a great move, because with the wood stove cranking, they dried in minutes. (There's daddy cat in the background adding more wood!) They slipped them on as they made and ate a snack- mini bagels decorated as cat faces. Don't those cats look grand?! It's like a storybook come to life! The girls took their "costumes" very seriously... masks have powerful transformational qualities. Suddenly, we had a house filled with very playful and animated cats. Perfect timing for some movement. We played musical cat beds for the longest time. How to play? Just like musical chairs, but folded towels acted as cat beds. My son is a wonderful pianist and entertainer, so he played as they crawled. When someone missed a bed, they got the lucky job of sitting on the couch to be fed a "cat treat" (a sunspire chocolate drop). The intention was to diminish any feelings of being "out" or losing. No none of that and it's amazing how effective a little bit of chocolate is. They could have played this for hours, but I was concerned about little knees on our sisal rug. We moved right into freeze dance. While the music played everyone had to do their craziest cat dance... the photographer got in on the action too, so sorry no photos... but it was good fun. Tomorrow I'll share a few of the handmade items crafted for our cats friends. This cat-inspired party is a great idea! A very unique way to celebrate a birthday party. Fun party idea! The girls do look great in their masks. Adorable! 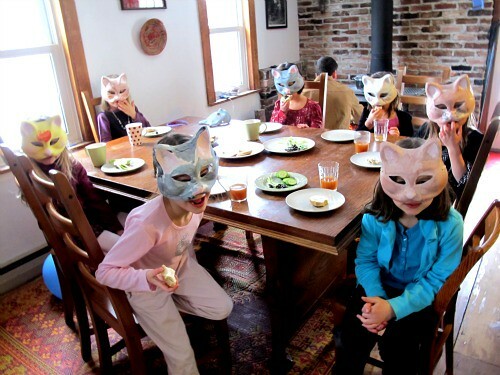 I love seeing all the kids in cat masks! makes me want to have a cat party, too, and I don't even have any kids (yet)! 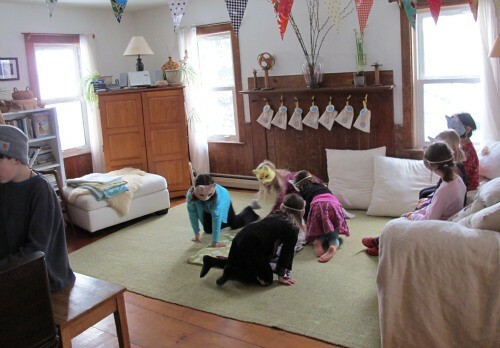 This wonderful party reminded me of the many "handmade" parties we threw for our 4 kids growing up. So much fun to plan! One year we even "flew" to London, had high tea and played pin the hand on Big Ben. Can't wait to see your next post with details! What a great idea for a party. I really love the idea of feeding the cat who doesn't get a bed a cat treat. That is inspired. I really struggle with organizing party games because I don't want there to be any losers. Oh, I love it! The masks are wonderful. What a lucky girl! 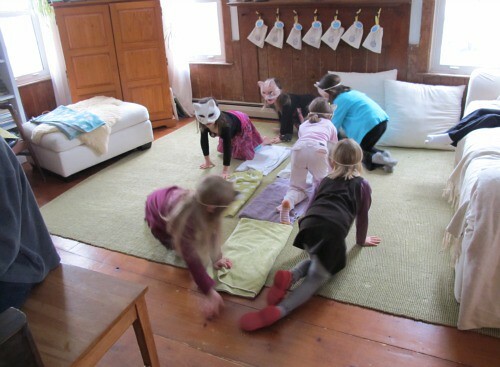 This is wonderful - I love how they are all caught up in the activities and play. Kudos to Entertainer Brother! Those masks are great! My daughter would have loved to go to a party like that (she already has her cat impression down pat...). Oh, this is so great. I love the kitty masks, and I think I have a 3-year-old in my life who might really need one (last year, he wanted a tail). I love seeing your beautiful house too! Happy birthday to your daughter. looks like so much fun! i have a ten-month old daughter and am so excited about all the birthday parties in the future. i think they will be as fun for me as for her! thanks for sharing your fun. Oh, oh, I have a Star Wars party request. Ideas?? What a great simple party idea. Thanks for the mask source. That looks like so much fun! Hmmm, I wonder if someone would have a cat party for ME for my upcoming 50th?!!! Those masks are fabulous! What wonderful memories you are making! Great Party... boy, my granddaughter would love one "just like it"! Who needs matching when you have all those great kitty faces? It looks like a PERFECT party! I love everything about it. I'm sure everyone had so much fun, especially your birthday girl. Oh, this is so great.One year we even "flew" to London, had high tea and played pin the hand on Big Ben.